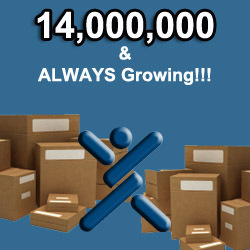 Over 14 Million Products to Choose From at WorldwideBrands.com! Variety of the spice of life! This cliché is so true when you are trying to select the right products to sell online. You need a place where you can see millions of different products from genuine wholesale suppliers so you can decide what you want to sell. Where can you find this kind of resource? Here at WorldwideBrands.com of course! We currently list over 8,000 wholesale suppliers that offer more than 14 MILLION products! These listed suppliers will either dropship, light bulk wholesale, large volume or liquidate the products. We add new suppliers, brands and/or products every business day. This gives our members a large variety of products to choose from to sell in their online stores, auctions, brick and mortar stores, flea markets and wherever else they decide to sell. Our members can also be assured that we verify the legitimacy of each of the suppliers that we list. So when you contact one of our listed suppliers to setup an account, don’t have any worries about the genuineness of the supplier! We take each supplier through an extensive verification process, sometimes even asking for pictures! We do this so our members don’t have to waste their time locating genuine companies to work with on their own. We’ve been doing this since 1999 and know what to look for and what to watch out for. Each supplier that qualifies to become a listed company is deemed a WBI Certified® Wholesale Supplier. In the listings on each company, we post the contact information, where they ship, how they ship, payment methods and ordering information and any other pertinent information that our members needs to know up front. We also show 3 sample images and list the brands and product types available from the suppliers. This entry was posted on Tuesday, April 9th, 2013 at 2:19 pm	and is filed under What's New, Wholesale Product Annoucements. You can follow any responses to this entry through the RSS 2.0 feed. You can leave a response, or trackback from your own site.